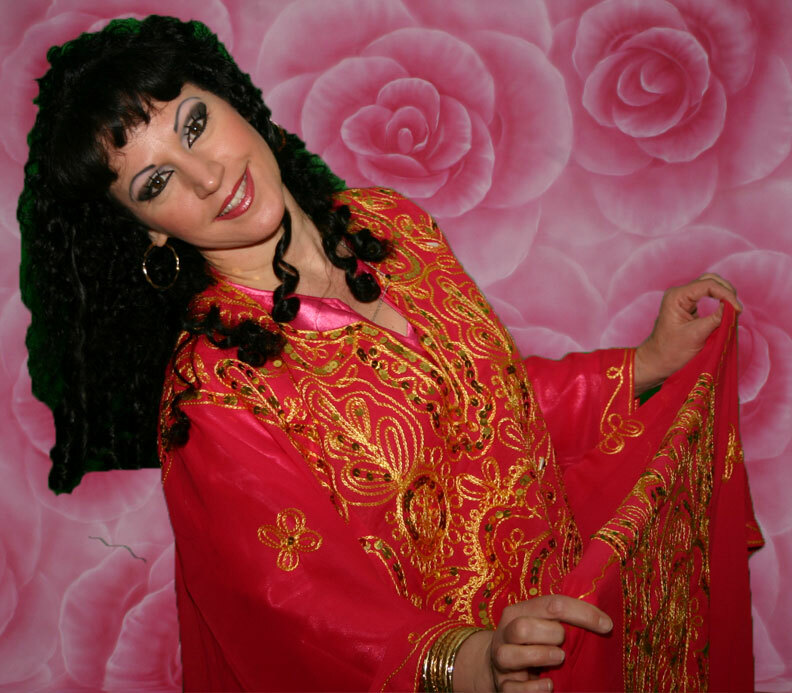 International Performer & Teacher for Middle Eastern and North African Dance Art to include Belly Dancing. Teaches workshops and projects for various dance styles from Egypt (Raks Sharki (Belly Dancing), Beledi, Chamadan, Ghawazi, Melaya Lef/Eskandrani, Saidi); Khaleegy (Gulf Region); Tunisia (Fezzani, Bounaouara); Morocco (Shaabi); Algeria (Algerwah, Choui, Ouled Nayl, Zindali,); Turkey (9/8); Andalusian (Spanish Arabic & Mushahat). Most projects and workshops can be taught with my husband and life long dance partner, Mustapha. Willing to travel long distances but must be afforded time to coordinate if during the week. Weekend travel is not be an issue. All travel must be paid for. Regardless of what dance form I am performing either alone or with my husband, Mustapha, you can expect a professional performance from beginning to end. Our costumes are custom made for us from Egypt, North Africa and Turkey and of course high quality music from either our music CDs that we produced or selections from our own music library that consists of over 1500 CDs. You will go on a journey with me of 1001 nights during my belly dance performance that includes lively entrances, level changes in the music with movements making me one with the music. Depending on the Belly Dance style, I may use props such as finger cymbals, veils, saidi sticks or balancing jars (sharabia) . After my performance, if required, I can have audience participation and take the people up to dance either free style or a debke (Arabic line and circle dance). If I am teaching a workshop or project, you can expect an explanation of the dance form I am teaching, breakdown of the music and rhythms, examples of costumes that I bring with me or photos with an explanation of the costumes and how they have evolved. Steps and combinations for that particular dance style and a small choreography upon request. Born in America, Khadejah has lived abroad since 1987 in Europe, the Middle East and North Africa. She was the Artistic Director of the Ahlam Dance Theatre in Germany that she and her husband founded in 1989. Known for her authenticity, she is a Master Instructor/Choreographer and teaches and performs Internationally. Her repertoire includes Raks Sharki, Arabic and North African folkloric dances. Among her many successes, she opened the show for Hakim at the Carthage Festival in Tunisia in 2001 and was the first American invited to teach at Raqia Hassan’s Ahlan Wa Sahlan Festival in 2002 and 2003 where she taught Tunisian folklore. She performed with the renowned World Peace music group featuring Yair Dalal. A member of the Tunisian Mothers Association, she has participated in numerous fund raising charities to aid Tunisian mothers and children. She is also a long time member and teacher with the Bundesverband fur Orientalische Tanz in Germany. Khadejah has appeared on television in the USA, Canada, throughout Europe, Middle East and North Africa. She teaches private as well as group classes and offers coaching for all levels. It is very important for me as a dancer to have a sound system that is very clear and of course loud. If I am on a stage, it is especially important for me to have monotone boxes facing me so that I can hear all of the nuances of the music and of course rhythms clearly. I like having a sound and light check before the performance to ensure lighting and music is understood between be and the technician. I am fond of colors mixed with pink since I have pink tones in my skin. I do not like like green or yellow lights, they wash me out. I don't mind strobe lights if used sparingly. I sometimes require a spot light as well. Stage should not be slipperly and it is important for me to know what the stage is covered with so that I can determine what kind of shoes, if any, that I will wear. I have my own music and lots off it. It is always good to know who my target audience is, e.g., Egyptians, Americans, Lebanese. This helps me greatly when I am choosing my music so I really cannot give you a set list. I have always been inspired by the teachers I learned from and other performers from the Middle East. Loud Sound System, Lights if available, area to dance in either stage or dance floor that are not slipperly.